Is there anything better than getting great coffee? Getting great prices too! 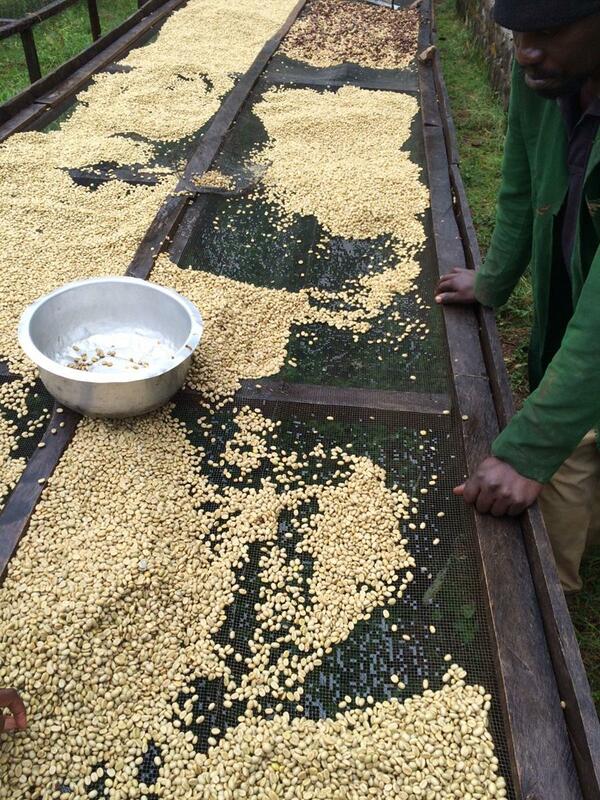 We’re celebrating the last few boxes of our Kenyan coffees by finding them great homes. To do this, we’re offering price reductions of up to 2€ per kilo on all 2017 and 2018 lots. Read about our experience and work in Kenya and then peruse our offerings complete with bag counts, pricing and cupping notes and scores below. We travel to Kenya twice each year. The first trip comes during the harvesting season when we visit our producing partners to witness first hand how that season is going. The second trip falls in February and we cup through tables and tables of preselected coffees for outstanding micro-lots to bring back to you. Our Kenyan coffees are sourced one of two ways. Sometimes we buy direct from farm-level sourcing projects or single farmer projects. Our local sustainability branch and sister companies in Kenya help us reach these farmers to build connections and purchase coffees in ways that help make coffee farming sustainable for small farmers. Other times we’ll purchase coffees go through the weekly Nairobi Coffee Exchange. Our exporter, Kenyacof, cups the entire catalog of for-sale coffees each week and purchases their favorites. Since we’re calibrated with their quality team, they know exactly which kind of coffee we’re looking for. This superstar coffee is from the west area of Kenya, near Mt. Elgon, on the border with Uganda, a region where fewer coffees are grown and purchased. ​Perminus Githinji Mwendia and his son produce top quality coffees from the approximately 7200 trees on their estate. The 639 farmers whose cherries are processed at the Mutitu factory farm an average of 1 acre of land. The Slopes of Eight program ensures that all the farmers’ crop is sold, guaranteeing them equitable prices and a steady income throughout the growing season. The uniform farm-management practices adopted by all eight estates has led to increased productivity, uniform and higher quality and higher profits for farmers. Producers process the coffee themselves on their farms. Their efforts are supported by Wycliffe, the agronomist at our sister company Kenyacof. The higher and steadier profits earned by the eight farmers involved in Slopes of Eight helps them invest in infrastructure to improve their crop each year. Owner Ann Wambui farms the land with her husband growing mainly Ruiri-11 varieties. Coming from the 2017 crop, we can undoubtably expect some age in these coffees. However, they preserved quite well due to the high quality of processing and production and premium storage condition. They still maintain the bulk of their iconic Kenyan flavors and cup characteristics. Many farmers intercrop their coffee with other plants such as maize, bananas and nuts. This increases biodiversity as well as food security in the region. The high altitude and rich volcanic soil of the region allows this coffee to flourish. A trained team separates cherries by color and ripeness at the Guama factory run by the Baragwi Cooperative Society. The estate keeps track of pruning cycles, fertilizer application and mulching to keep the trees strong and healthy. This results in big cherries and beans rich in sugar, acids and fats. A.K.A: extra tasty coffee! Our sale runs from now until Friday February 8th. Get in touch now to order your coffee or request samples to secure this limited time sales price!